Quties Kid's Care at Physiq Fitness | You work (out). They play. The gym can be the favorite place for everybody in the family! You get a killer workout. Your kiddos get great care. Kids club offers little Quties, ranging from 6 months to 12 years old, a secure, clean, and fun place to play. They’ll want to go to the gym more than you will! Vary by location, pick a location to see specific hours. First Child is $15/month. Additional children are $10/month each. We put kids first like you do! Each of our Kids Club Team Members is pre-screened before hiring, has a current CPR & AED certification, and has cleared a background check. With our strict 1 to 10 staff to child ratio, you sweat it out without having to sweat about your kids! We strive to provide a safe, fun, and inexpensive childcare option for the children of our members. Physiq Fitness is not a state licensed childcare facility, as our services are available for a maximum of 1 1/2 hours, therefore children’s parents are required to be on site. Your children will love to stay in one of our fun and interactive child care facility at Physiq Fitness. We have designed the following child center policies to provide a healthy, safe and secure environment for all children in the facility. Unless required by law, our child centers are not licensed, nor equipped to provide one-on-one care for children of any age. 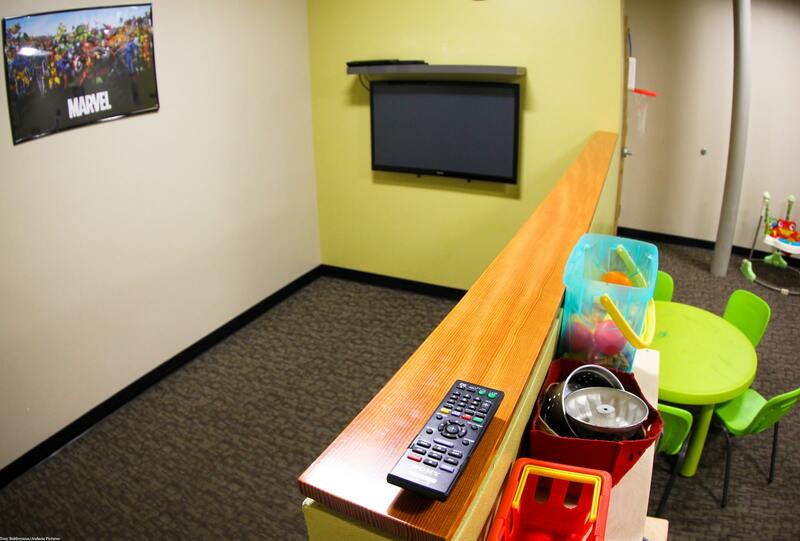 We may limit the use of the child center in our discretion, including designated play spaces. We reserve the right to terminate or suspend child center privileges for failure to follow these policies or other directives or instructions from our child center team members. Use of Child Center. Child center may be used only by members that have added childcare to their memberships. The appropriate age for child center guests is from six months to 11 years of age (“child”). A child may use the child center up to one a half (1 1/2) hours per day. Members may only use the child center if they have been added to the membership of a parent or legal guardian or, upon execution of the proper agreement, a grandparent, nanny or au pair (“parent” or “you”). The same parent must check in and check out the child, each time by presenting a Physiq Fitness membership card or government-issued photo identification card with a picture that matches the system profile. That parent must remain in Physiq Fitness at all times while the child is in the child center. If the child center has reached maximum occupancy, you must wait for space to open up. Late Pick Up. If you pick up your child from the child center later than the time permitted for use, we will, after the third time, suspend your child center privileges for one month. Behavior. To address behavioral issues, we will implement the use of “time-outs” for children two years of age and older and activity redirection for children younger than two. We will page parents if a crying child cannot be comforted within 10 minutes. We reserve the right to terminate or suspend child center privileges for any child who exhibits unsafe or inappropriate behavior. Clothing and Diapers. Children must be completely covered on top and bottom, including shorts, pants, tights or other covering over diapers and underwear bottoms. Children must wear socks and/or shoes; bare feet are not allowed. Wheels on shoes must be removed prior to entry. Parents are responsible and will be paged to change their own child’s wet or soiled diaper. Food and Drink. You may bring into the child center a labeled “sippy” cup with water only or, for an infant, a bottle with milk or pre-mixed with formula clearly labeled with your child’s name. We will not mix formula for bottles. You may not bring into the child center any juice, milk, soda, snacks, candy, gum or other food from home or Quench. A child with chicken pox, until no longer infectious and the lesions, are crusted over. A child with untreated and/or contagious lice, ringworm, or scabies. ***Check in your child. Check Physiq Fitness for hours; the last check-in occurs 45 minutes prior to closing. Your children are important to us and we look forward to working with them. Please contact a member of the Physiq team if you have any questions or concerns. Find your Physiq Location nearest you with a Quties Kid’s Club for hours and rates.